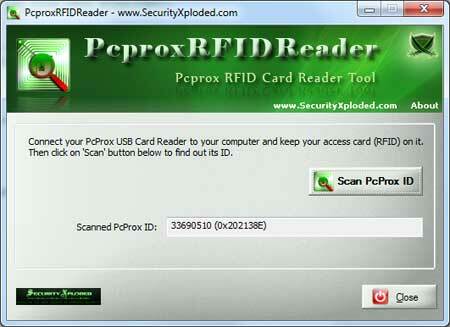 Pcprox RFID Reader is the FREE tool for reading RFID/HID card ID using pcProx USB readers. PcProx is popular range of HID (RFID) card readers - from RFIdeas Inc - typically used by administrators to configure and enroll new (HID based) access cards. These access cards are commonly used as identification and tracking mechanism for employees in most organizations around the world. Pcprox RFID Reader makes it easy to read the ID or number embedded inside those HID based access cards. It supports all range of USB based PcProx readers from RFIdeas Inc. Here are common use cases of PcproxRFIDReader * Offers great help to administrators while configuring & enrolling new access cards (HID) * Makes it easy for troubleshooting any problems associated with pcProx card reader or HID card. * In case of manual registration process, user can find out their HID card ID and send it for registration. * Just for fun, you can find out the ID or number of the HID card that you are carrying. PcproxRFIDReader comes with installer which helps in local installation & un-installation of the software. It works on most of the Windows platforms starting from Windows XP to latest operating system, Windows 8. Program that allows you to easily rent or sell time on your computer. Will block any specific programs or functions (such as Web browsing) that you tell it to until the user inputs a password that allows access for a set time. Sell the passwords. Install Glimpse for Mobile Data free tool to provide a snapshot of your end users' connections for devices connecting through the Windows 7 Mobile Broadband. Allows Help desk to support their users efficiently. Easily set up and protect your product's thank you page and download links using the user-friendly interface. This software generates one simple script to get your Thank-You Page URL. Effectively manage all your product downloads. Password protect 13 Windows settings and functions: Computer time and date, System Restore, Video display properties, Internet Options, Add/Remove Programs, User Accounts, Windows Security Center, System Properties, Add Hardware Wizard, etc. Freeware program for the management of the internet-cafes, computer clubs, internet-game clubs and such other. InstallGuard lets you block all new software installations and only allow authorized users to install new software, helping you protect your system and privacy. Allows you and your members sign in to your SharePoint site with any OpenID provider or Live ID, Facebook . You can manage member's permissions before and after user's sign-in to your site via SharePoint standard access pages such as people picker. Screen Pass is a screen locking system for WindowsÂ® that extends the capability of the standard workstation lock and gives network administrators complete control over idle. This site does not contain serial number, crack, keygen Pcprox RFID Reader serial number : serial number is the simplest type of crack. A serial number(cdkey,product key,etc) is register the program as you may already know. a crack or keygen may contain harmful software. If you cannot find the exact version you want, just give it a try. for more information read .nfo/.txt/.diz file include in zipped file.